Donegal Town captain Ciaran O’ Reilly receives the Voodoo Venue Cup from Donegal League officials Terry Leyden and Jimmy Haughey. 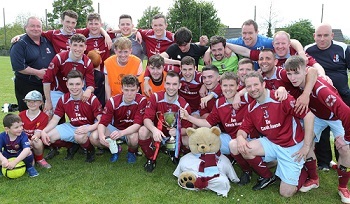 Donegal Town cruised to cup final success when they proved much too strong for Cappry Rovers in Saturday's Voodoo Venue Cup Final in Convoy. Twenty-one minutes is how long this Saturday Cup Final was a contest. By that stage James Kerrigan had hit the Cappry net twice and his second seemed to drag the very life out of a Cappry side who were already struggling. Kerrigan ran on to a long ball over the Cappry defence on 14 minutes and the deftest of flicks sent the ball beyond the reach of Eoin Gallen in the Rovers net. His second, this time a close range header, left Gallen stranded. Kerrigan had by now laid the foundation for his side’s success and in doing so he began a shift that would see him awarded the Man of the Match accolade. Orchard Park in Convoy was in pristine condition for the final. However, the weather - real summer sunshine fair - did manage to have an impact on the match as referee Dessie Mc Laughlin called a halt to the action midway through the first half to allow the players a chance to take on some liquids. The water break didn’t improve Cappry’s situation and Donegal grabbed a third on 41 minutes, this time it was Gary Ward who fired home from a narrow angle just inside the penalty area. The second half was something of an anti-climax as Rory Dunleavy’s side knew they only had to avoid a total collapse in order to collect the spoils of the day. Eoin Slevin added their fourth goal on 62 minutes as the game became littered with substitutions. Although defeated on the day what was a mainly young Cappry side played the game out until the final whistle and for that they deserve great credit. Donegal captain Ciaran O’ Reilly was presented with the Voodoo Venue Cup by Donegal League officials Terry Leyden and Jimmy Haughey. CAPPRY ROVERS RESERVES: Eoin Gallen, Kieran Neeson, David Carr, Pete Lafferty, Andrew Walsh, Paddy Long, Niall P. Mc Daid, Conor Scanlon, Kyle Lafferty, Joel Bradley Walsh, Darren Kelly. Subs: Cian Mc Glynn for Darren Kelly (45), Sean O’ Donnell for Paddy Long (57), Kyle O’ Meara for Conor Scanlon (65), Liam Gallagher for NP Mc Daid (80), Tony Carlin for David Carr (85). DONEGAL TOWN RESERVES: Enda Kenny, David Bustard, Shaun Kennedy, Ryan Hegarty, John Paul Byrne, Sean Boyle, Gary Ward, Ciaran O’ Reilly, Ronan Mc Hugh, Eoin Slevin, James Kerrigan. Subs: Ben Sweeney for Gary Ward (65), Avi Rosenthal for Ciaran O’ Reilly (68), Noel Gavaghan for Shaun Kennedy (70), Stephen Curneen for James Kerrigan (75), Aaron Gallagher for David Bustard (85). ASSISTANTS Joe Mc Hugh & Mick Lagan.